The goal of Up is simple: inspire people to move more, sleep better, and eat smarter in order to live healthier and happier lives. It's designed to be worn 24 hours a day, every day, so it has to be fashionable, comfortable and rugged enough to hold up to the wear and tear of everyday life. 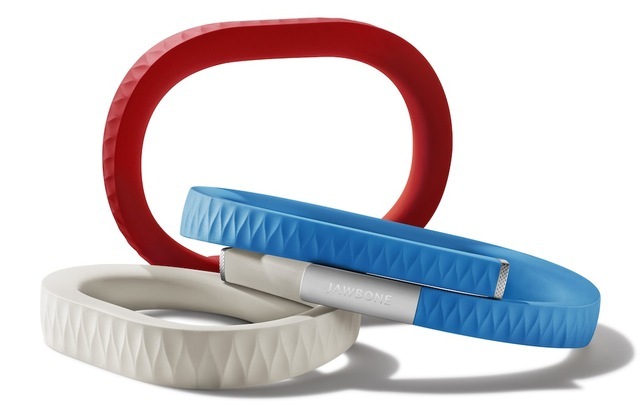 To that end, Jawbone claims that Up is lightweight, durable, and water resistant to a depth of one meter. As a fashion accessory, it ships in blue, red, silver, white, brown, red, and black bands and fits wrists as small as 14 - 15.5cm (19 grams), as middling as 15.5 - 18cm (21 grams), and as large as 18 - 20cm (23 grams). Jawbone provides a sizing guide that helps you choose the appropriate sized Up before clicking the buy button. 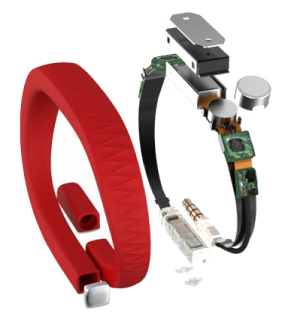 Up integrates the same Fullpower-MotionX engine already found in the Jawbone Eramotion-controlled Bluetooth headset. Inside Up you'll find a 10-day rechargeable Li-ion polymer battery that takes about 80 minutes to charge, a vibration motor that powers the Smart alarm and reminders, a motion sensor to detect your sloth, and a 3.5mm plug that plugs directly into the iPhone's headphone jack or into a USB jack via a USB adapter cable. Up measures and stores activity data like steps, calories burned, and your distance and pace of travel. It also tracks your inactivity for comparison and will gently nudge you with a vibration when you've been idling too long. Up also makes approximations of your sleep activity based upon your nocturnal movements and promises to gently vibrate you awake each morning at just the right moment of your sleep cycle to guarantee a fresh start to the day. You can even use the iPhone's camera to help create a food journal of what you ate, where you ate it (using the iPhone's GPS), and how it made you feel afterwards. The Up iOS app for iPhone 3GS / 4 / 4S and iPod touch is available now. The Up band will be available in the US on November 6th for $99.99 direct from the Jawbone and Apple shops online as well as Best Buy and Target locations. It hits the UK on November 17th before making its way globally in the months to follow.